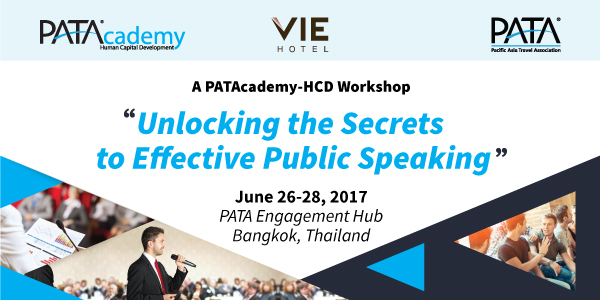 BANGKOK, 2017-Apr-18 — /Travel PR News/ — The 8th PATAcademy-HCD, under the theme ‘Unlocking the secrets to effective public speaking”, takes place at the Pacific Asia Travel Association (PATA) Engagement Hub in Bangkok, Thailand on June 26 – 28. This entry was posted in Business, Festivals and Events, Travel, Travel Education & Courses, Travel Marketing, Travelers and tagged Amélie Yan-Gouiffes, Dr. Mario Hardy, Effective Public Speaking, PATA, Stu Lloyd, Workshop. Bookmark the permalink.